Rhodri Davies is the head of “Giving Thought”, the in-house think tank of Charities Aid Foundation. He believes that, “Although philanthropy is growing in prominence, there is still a real lack of clarity about its overall role in our society” (page 7) and in Public Good by Private Means he seeks to affirm its continuing role and clarify what that role is. The result is an interesting, though provoking and readable book that could assist people who wish to provide material support for charity or wish to influence public policy. Unfortunately, however, the book suffers from a number of deficiencies, which diminish its overall impact. The most fundamental of these deficiencies relates to the thing that Davies is analysing. He expressly declines to give a precise definition of “philanthropy” (page 8). Instead, he says that he considers “the characteristics that typify philanthropy in its modern form” (page 8) and he leaves us to absorb his understanding as we read on. He distinguishes medieval religious alms giving “where the focus was primarily on what it meant for the donor and their immortal soul” from modern philanthropy, which he regards as giving “focussed on addressing the problems of society” (page 8) and it is clear that he does not have religious motivation or giving to religious causes in mind. Furthermore, although there is some discussion of support for the arts and education (e.g. page 99ff), it is clear that he is thinking mainly of the alleviation of poverty in much of his discussion. Indeed, his focus appears to be primarily on poverty in the UK (and, to some extent, the USA) rather than in the world as a whole. Of course, an author may define his subject as he pleases. However, it is questionable whether Davies’ restricted focus is helpful and, more seriously, his lack of precision leads to conclusions that, on their face, appear to apply to a broader range of charitable activity than is justified by his arguments. Parts of the book are tightly argued but Davies has a tendency to make sweeping assertions that lack support. For example, he asserts that “Philanthropy, properly understood, is about trying to improve society by tackling the root causes of problems, rather than just addressing their symptoms” (page 12) and thereby, dismisses disaster relief from its ambit. Likewise, a few lines later, he asserts that “tolerance for risk is one of philanthropy’s greatest assets” and later rhetorically asks “If philanthropy is unwilling to break the bounds of convention or afraid to think beyond the status quo, then what is the point of it?” (page 173). Whilst few would deny that there is a place for risk taking and “breaking the bounds”, this dismissal of other forms of philanthropy is surprising. More seriously, important assumptions that underlie some of the book’s statements and conclusions are never properly examined or even, in some cases, stated. The most pervasive of these is the acceptance of what might be called the “post war consensus” regarding the role of the state. Davies appears to believe that the only theoretical alternative to the state doing those things that it does at the moment is for charity to do them and he rightly regards this as being impractical. However, he never considers the possibility that some of the things that are done ought not to be done at all, since they do more harm than good. 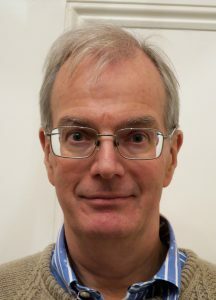 Davies also appears to accept the view that poverty is, at least largely, “something stemming from the wider failings of society” (page 35) and to regard the view that it may result in part from the failings of an individual as being hopelessly out of date. Indeed, he appears to believe that the poor are poor because the rich are rich since he states that “While the rich might not be entirely to blame for society’s failure to distribute wealth more evenly, the very fact that they are rich while others are poor is the root of the problem” (page 158). This is a disappointingly naïve approach. The book suffers from a disturbing schizophrenia when it comes to individual choice. Davies asserts that, “The freedom for individuals to choose where they direct their gifts lies at the heart of philanthropy and gives it much of its strength” (page 11). Yet elsewhere he suggests that “what constitutes and acceptable charitable purpose is an ongoing source of debate” (page 192) and he states that “Philanthropy poses a fundamental challenge to democracy: by offering individuals a way of furthering their own priorities outside the normal democratic process, it potentially subverts the authority of elected officials and allows a small minority of those with significant wealth to exert a disproportionate influence on the direction in which society is travelling” (page 85). This implies that society should only allow philanthropic giving in line with some centrally determined priorities, which would require authoritarian governmental interference. In relation to this and a number of other matters, it is unclear precisely what Davies’ views are since it is unclear whether he is merely reciting the arguments of others or endorsing these arguments. Overall, however, the book has a decidedly left-wing flavour. For example, the adoption of Finlayson’s view that levels of trust in charity fell following the 1926 general strike because of the efforts of volunteers (including Oxbridge students) in “strike breaking” (page 64) is contentious. Likewise, the suggestion that “the empowerment of women through charitable activities” is something that was seen in “the experience of women during the British miners’ strike of the 1980s” (page 90) is, to say the least, a strange choice of example. These deficiencies may leave some wondering whether the book has any value but this would be an unduly severe judgement. It places modern philanthropy firmly within an historical context and the short “case studies” inserted in the text bring the history to life. By describing approaches in past centuries and views and arguments expressed in the past, it allows the reader to consider possibilities that might be ruled out by the prevailing twenty-first century consensus. Furthermore, whatever one may think about the arguments that have been and continue to be made against philanthropy, it is essential that we understand and address these arguments. The book also contains valuable discussions of some important policy issues. These include the perennial hot potato of the involvement of charities in political activity, the justification for tax breaks for charities and giving to charities and the question whether charities should accept money from tainted sources. As regards the first of these, Davies states that “one of the main points of this book is to argue that involvement in the ‘political’ arena through campaigning and advocacy has always been one of the most important aspects of philanthropy organisations” (page 95). However, he later criticises some Victorian philanthropists on the grounds that they “brought ideological baggage with them” and he refers to “The necessity to look beyond ideology in picking philanthropic approaches” (page 188). It is unclear how these statements are to be reconciled and one is left with the impression that Davies supports an ideological approach provided that he agrees with the ideology! Nonetheless, by laying out the issues, he has assisted the debate. Much the same could be said for many aspects of Public Good by Private Means. One does not have to agree with Davies’ assumptions, statements or conclusions to benefit from reading it. Provided that it is read in a critical manner, it should stimulate valuable thought and discussion. That is why it deserves to be read. 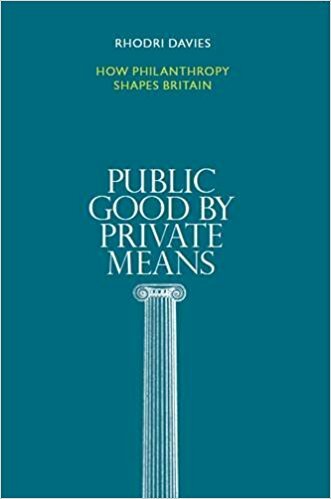 “Public Good by Private Means” was published in 2015 by Alliance Publishing Trust (ISBN 978-1-907376-24-5). 207 pages (excluding bibliography and references).